The 2010 USA Cycling Collegiate Road National Championships were held in Madison, Wisconsin as the best collegiate athletes from across the country met for a weekend of elite racing. Riding for Notre Dame were Jenn Perricone in the women’s field and Douglas Ansel and Joe Magro in the men’s events. Racing began Friday morning with a challenging Road Race through Blue Mounds State Park. Had Chicago been chosen to host the summer Olympic Games in 2016, this route would have been the site of the cycling events. Snaking through the woods of Southern Wisconsin, the course featured over 8,000 feet of vertical climbing for the 75 mile men’s race and 6,000 feet for the 50 mile women’s race including a mountain of over 2 miles and 800 vertical feet every 15 mile lap. Ansel and Magro were called to the start line at 8:40am, a steady rain serving as a foreboding omen for the racing to come. The first 3 miles of the race were run at over 40mph down the side of a mountain and Ansel soon found himself losing ground as the leading group screamed through the winding descent. Forced to chase back to the group on the flatlands before the larger climbs, Ansel ultimately was unable to move to a secure place in the field and was dropped on the first ascent of the mountain. Magro rode in the quickly shrinking front pack comfortably the first lap. On the second ascent of the mountain, Magro was uncoupled from the leaders but was able to rejoin the peloton, now down to 25 riders, on the following descent. 45 miles into race, and the third time up the mountain, Magro again lost about 20 seconds to the leaders but exhausted from the effort, and unlikely to place highly, he pulled out to save energy for Saturday’s criterium. Perricone began her race with aspirations of a Podium finish, but the fast deteriorating weather conditions proved a bigger obstacle than any of her competition. Jenn stuck with the front group for first lap, but as the temperature dropped and rain turned to hail she had visions of her crash two weekends ago at the Conference Championships. On the descent of the mountain, Perricone was unwilling to take risks on some of the tighter corners and soon withdrew from the contest. Hoping to improve on the previous day’s results, all three Notre Dame Cyclists looked forward to Saturday’s criterium in downtown Madison. The 4 corner kilometer long course circumnavigated the state capitol building with the only geographic obstacle being a slight rise between the 3rd and 4th turns. Large crowds turned out to watch the center city event making for a great atmosphere for riders and spectators alike. Perricone got the action going for Notre Dame but, still tentative from her accident at regionals, was never seriously in contention. In men’s event, over 80 riders from Alaska to Florida gathered at the start line for an hour of lightning fast racing. As Notre Dame’s first rider called to the start line, Magro was positioned fairly well from the beginning, but Ansel was not as fortunate and began the race from the rear. The first five laps were ridden in the neighborhood of 33 miles per hour and Ansel was an early victim of his starting position. 12 minutes into the race, he finally was unlatched from the rear of the peloton and forced to abandon. Magro rode in the center of the field for much of the race and comfortably accelerated with the flurry of attacks that marked the opening laps. Thirty minutes into the race, what was once an 80 rider field had been reduced to fifty with Magro still riding comfortably. With ten minutes remaining, Magro made a move around the inside going through turn 2 and was able to move into the top 15. His good position was short lived however, as an attack from Mesa State brought a multitude of riders to the front and past Magro. In the closing laps Magro again attempted to move into a good position for the sprint, but the speed of the field (race average of 27.5 mph) made his task difficult. At the finish, Magro came home in 36th as Mesa State’s powerful lead out train controlled the final lap and delivered their sprinter to victory. The rains held off long enough in West Lafayette Saturday for all the Midwestern Conference Championship road races and time trials to be run in relatively dry conditions. Notre Dame was very successful throughout the day with the team’s achievements highlighted by Jenn Perricone’s 3rd place in the Women’s A race and resulting D2 road race championship. Action started early in the morning for the Irish in the Men’s B team time trial. Brian Boyle, Ethan Ferguson, and Nate Lee represented ND against the other teams of the Midwest. Each rider taking turns breaking the wind at the front of the paceline, Notre Dame navigated around the 6.5 mile course in 16 minutes 37 seconds. At the finish, ND came home in 3rd place in the conference, first among Division 2 teams. Racing resumed in the afternoon with the road race event held on Purdue’s 8 mile course featuring two small climbs and moderate crosswinds. Nate Lee, Ethan Ferguson, Brian Boyle, Brendan Kiefer and Josh Johnson all started the 50 mile men’s B road race for the Irish. The race got off to a slow start with riders from all schools hesitant to make an attack. The slow tempo caused a bunching of the field which made for dangerous conditions. Three Notre Dame Riders, Lee, Boyle, and Ferguson were involved in a crash and while Lee and Boyle were able to chase and rejoin the main field, a damaged shifter on Ferguson’s bike made finishing the race impossible. As the competition entered its final stages, two riders were able to separate themselves from the main field and, as their advantage grew, the race became one for third. In the final dash to the line Kiefer was the best ND finisher in 11th followed by Johnson in 19th, Boyle in 25th, and Lee in 27th. In the 50 mile Women’s A race, Jenn Perricone of Notre Dame was matched against an elite field of riders including Sinead Miller, a member of the United States National Team. Riding strongly at the front of the field, Perricone watched her rivals until Miller made her attack. Following right in Miller’s slipstream, Perricone and Ashley James of Lindsey Wilson College were the only riders strong enough to stay with Miller and, as their gap over the main field quickly grew, it was clear the winner would come from these three riders. All three worked together until the closing miles when jockeying for position for the final sprint began. Perricone led out the sprint and was passed in the closing moments by her two rivals. However, her 3rd place position was the best of her collegiate career and, because she was the first D2 rider to cross the line, made her the Division 2 Women’s Road Race champion. Each week of the 2010 season Perricone’s results have improved, a trend that bodes well for her goal to win the collegiate national championship to be held in Wisconsin two weekends from now. Racing concluded on Saturday with the 70 mile men’s road race. Both Douglas Ansel and Joe Magro were on the start line for Notre Dame, along with over 70 other competitors in what shaped up to be the most competitive contest of the season. The first 18 miles were run at a high tempo with no one able to escape from an aggressive peloton. Finally, at the beginning of the third lap, a breakaway of 9 separated itself from the field. Their advantage peaked at a minute thirty, and while it dwindled in the closing miles, these riders were not seen by the main field again. Both Magro and Ansel fought for position towards the front of the peloton throughout the race as the difficult pace gradually shot riders off the back of the field. With 24 miles remaining, another group of around 10 distanced itself from the rest of the main field on the second of the courses two climbs. Still feeling strong and wanting the chance to sprint for a high overall place, Ansel and Magro moved to the front of the peloton and began pursuit of this second breakaway. Two miles later, the field was back together again and both Notre Dame riders slipped back into the draft to recover. On the final lap, speeds reached in excess of 46 miles per hour on the descent 2 miles before the finish. With less than a mile remaining, Ansel’s front derailleur broke making him incapable of shifting into his big front chain-ring. Unable to hold the high speed with only his small ring, Ansel was left behind by a charging main field. Magro shot wide around the final turn and quickly moved from the rear of the main field to the front for the final sprint. He crossed the line in 21st position, 4th among D2 riders, a strong result in a field containing many professional s. After 70 miles, the Men’s A race had averaged 25.5 miles per hour, making it one of the fastest and the longest of the entire season. Cloudy skies gave way to torrential downpours on Sunday and rider’s tackled the challenging .6 mile criterium circuit around Purdue’s football stadium. Each lap included a short steep climb on the front stretch followed by a fast descent on the backstretch. Conditions were made especially dangerous by the narrow roads and soaking wet sharp left hand turns at the bottom of the steep hill. Ferguson, Boyle, and Lee all took to the start line for the Irish in the Men’s B criterium. Attacks were fast and furious at the beginning of the event as riders looked to use the dangerous conditions to their advantage. On the first descent of the major hill, Lee’s brake pads, soaked by the rain, slipped on his wheels causing a highly dangerous scenario. Lee was able to stay upright on his bike, but lost contact with the back of the field and withdrew soon afterwards. Twenty minutes into the event, Boyle also pulled out citing the dangerous conditions. Ferguson, the last ND rider still in the race, continued and as the pace quickened he too was unhitched by the field. Fighting on regardless, Ferguson was gaining ground on his rivals but was forced to quit by the race official. As only 15 riders remained in the race at this point, Ethan was credited with a 16th place out of over 30 starters. Perricone started the Women’s A criterium looking to build off her success of the day before. An early breakaway of three riders was established in the opening moments, but Perricone was close behind in the first chase group of only 6. Riding strongly in this group, Perricone was poised to drop her rivals and continue on after the breakaway alone when disaster struck. Screaming down the backstretch’s steep descent, Perricone slipped on the wet, glass like crosswalk paint in the intersection of the 3rd turn. Losing control of her bike, Perricone slammed into a pole at over 30 miles per hour, and then was thrown into a tree before finally sliding to a stop some 20 meters after the apex of the curve. As the ambulance came to take her to the hospital, Perricone was more concerned about her bike which now lay in pieces next to her. The front fork and headset had been ripped off the rest of her frame while the frame itself was cleaved in two in 3 other places. Evidently, the pole had cut through her bicycle as they collided. Amazingly, Perricone came through the accident without a scratch and after x-rays were taken it was determined she’d only suffered serious bruising to her hip, leg, and ribs. With knowledge of Perricone’s crash fresh in his mind, Magro made an effort to ride safely in the Men’s A race. For the first two laps he was able to stay at the front of the field, but the ridiculous speeds in the corners proved too much and he soon fell to the rear and off the back. Magro was able to rejoin the main field, but 30 minutes into the event the pace quickened again and, not feeling his strongest and not wanting to risk injury with nationals two weeks away, he withdrew. With conference championships behind them, Notre Dame now turns toward Madison, Wisconsin for the Collegiate National Cycling Championships. Perricone will race for a title in both the Women’s Road Race and Criterium while Joe Magro and Douglas Ansel will represent the team on the Men’s side. Action begins with the Road Race on May 7th and continues throughout the weekend. 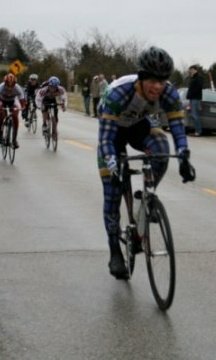 The MWCCC stopped by East Lansing, MI this Saturday for the last road race of the 2010 regular season. Michigan State’s course was only 4.5 miles long, but featured one section of dirt road which stretched for nearly a mile of the route. This lone stretch of dirt proved to be the defining factor of the days racing for Notre Dame. Junior Brendan Kiefer and Josh Johnson were the first of the Irish to ride, both in the 30 mile Men’s B race. This race got off to a fast start as a Lindsey Wilson College rider attacked from the gun, but the pace soon slowed as he flatted his rear tire just seconds after turning on to the dirt section. Shortly thereafter, Kiefer also flatted and was forced to take a wheel out of the wheel van. After fixing the mechanical he attempted to rejoin the field, but the gusting winds made this task impossible. Farther forward in the main field, Johnson lost contact with the leaders after the second trip through the dirt section. Both Johnson and Kiefer finished the race, but not before Kiefer suffered another flat and was forced to ride with with one inflated tire, one not. Making his debut in the Men’s A category, Doug Ansel didn’t find much more luck than Kiefer or Johnson. He started strongly, but the high tempo, hovering around 30 mph, carried through the dirt section, into a headwind, proved to be too much and he popped halfway through the third lap. Ansel rode the next 40 miles to the finish alone to cap off the day’s racing for Notre Dame. Saturday night saw racers make the short commute from East Lansing to Ann Arbor, the site of Sunday’s criterium. The University of Michigan’s criterium course was a high speed, 4 corner track on freshly paved roads with a gradual hill on the backstretch the only obstacle riders faced besides the moderate crosswind. With the frustrations of the day before still fresh in mind, Kiefer and Johnson looked for better luck in the Men’s B race. While Johnson rode comfortably in the main field, Kiefer was in the thick of the action at the front of the pack for most of the race. A small breakaway of three riders got free 30 minutes into the 45 minute race and were not seen again by the main field until the finish. With two laps to go, Kiefer tried to bridge from the peloton to a Purdue rider caught in the space between the break and the field, but he could not quite close the gap. Pulled back into the fray, Kiefer didn’t contest the sprint for 4th while Johnson finished in the middle of the pack. Jenn Perricone, Women’s A, raced after Kiefer and Johnson. Before the race, Perricone planned to attack the field early and often to un-hitch the weaker girls and shrink the group. Trying to turn her plan into reality, Jenn led the field through the first turn and onto the backstretch, but the bunch stayed largely intact. Not wanting to waste any more energy, Perricone slipped to the back and waited for an opportunity to go on the attack again. Towards the middle of the 45 minute race, Jenn again jumped off the front, this time with 2 other riders. Her attack was short lived however, and an active main reeled the breakaway in. As soon as this break was swallowed, Rita Klofta (Depauw University) took a solo flier off the front and established a 15 second advantage. For the remaining 20 minutes of competition the peloton strained to bring Klofta back, but were unable to do so. Perricone rode strongly in the closing laps and finished second in the field sprint, or 3rd overall for her best result of the season. Competition Sunday concluded with Magro and Ansel in the Men’s A race. A field of over 40 riders began the 60 minute race, but this number began to dwindle even in the opening laps. A stern tempo was established as rider after rider attempted to break free of the main field. Magro and Ansel both rode in the middle of the peloton in the initial minutes of the race, sheltered from the strengthening crosswind. 25 minutes into the race, a small gap formed in front of Ansel coming out of the second turn. Sprinting up the hill on the backstretch to regain contact with the field, Ansel was buffeted by the wind and could not make up any ground. Soon after he abandoned, no doubt still feeling the long solo ride of the day before and a lingering hip injury suffered at Southern Illinois. Magro continued on in a race which soon became dangerous. During the 40th minute, a rider took turn 3 much too quickly and drifted out of his line and into the rider to his outside. The collision started a chain reaction crash in the center of the field which ultimately eliminated over 8 riders from the race. Magro came through the crash unscathed and briefly found himself in a breakaway, but the main field was soon back together again. As rider’s crossed the start/ finish line with 4 laps to go, a racer attempted to pass Magro on the left. A hole that was there quickly closed and the two bikes became tangled. The other rider smashed into the asphalt at close to 30 miles per hour, but Magro was able to correct his leaning bike and continue on. On the final lap, Magro tried to move to the front, but the high speed made advancing position near impossible. He still crossed the line in the top 15 and ensured qualification in the Collegiate National Championships to be held May 7-9 in Madison, Wisconsin. Next weekend, Notre Dame travels to Purdue for the Midwest conference championships. Much is on the line as Perricone looks for victory; Ansel attempts to qualify for Nationals, and Johnson, Kiefer, Magro, Ferguson, Lee, and Boyle all look to score good results at the conference championships. 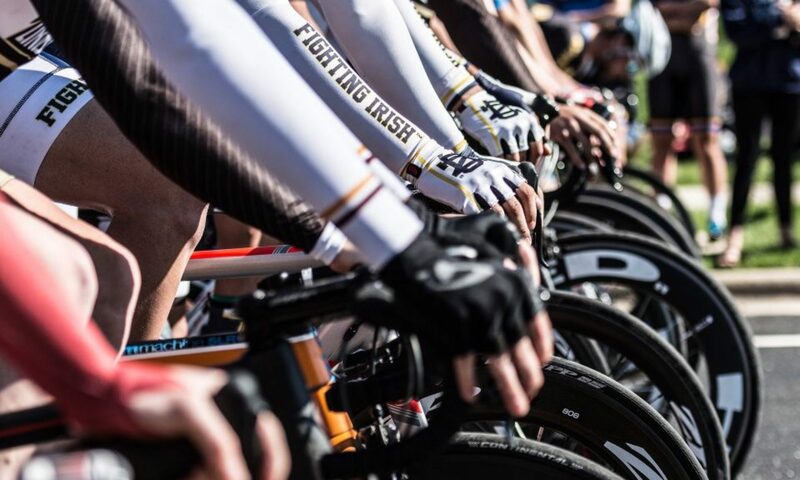 Nearly every Notre Dame rider competing this weekend was doing so in a new category as the team’s numerous successes throughout the season resulted in a number of upgrades. Both Nate Lee and Josh Johnson moved from the Men’s C to Men’s B races and Joe Magro made his debut in the Men’s A field. Also competing were Ethan Ferguson in the Men’s B and Jenn Perricone in Women’s A.
Perricone was the first to compete Saturday morning on Ohio State’s rolling 5.5 mile road race course through the fields outside Columbus, Ohio. After only 2 laps of racing, the race had splintered into 2 groups. 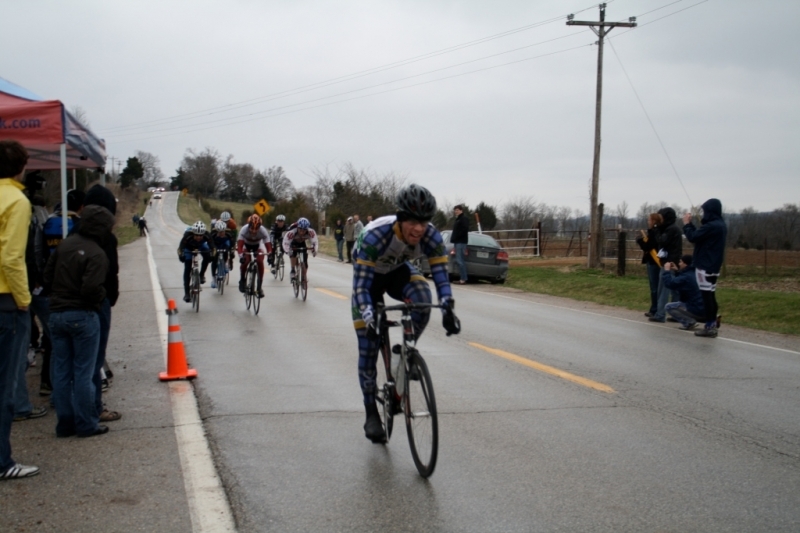 Lodged in the lead group, Perricone was the only rider not from Lindsey Wilson or Marian University. Riding strong with little help from the others, Perricone had begun to separate herself from the group when, in a stroke of bad luck, her rear tire flatted. In an impressive display of determination, Perricone took a rear wheel from a teammate on the side of the road and continued on in pursuit of the pack. Her resourcefulness paid off as Perricone was still able to finish in the top 10. Half an hour later Lee, Johnson, and Ferguson rolled off the start line in the Men’s B field. Attacking began within the first mile of the race as Marian University used their numbers advantage to send three rider’s clear down the road. Two chase groups formed with Lee in chase 1 and Ferguson and Johnson in chase 2. Lee rode intelligently in his chase and although he never came back in contact with the three leaders he won the sprint in his group for an impressive 4th overall in his first race in the B field. Johnson and Ferguson set the tempo of chase 2 and in the final mile Johnson accelerated out of the group, with Ferguson on his wheel, crossing the line in 12th and 13th place. Notre Dame’s final competitor on Saturday was Magro in the 50 mile Men’s A race. The field was content to leisurely roll through the cornfields for the first few miles, but when the attacks started the place didn’t slow again for 30 miles. Magro stayed in the shelter of the main field as a breakaway and one chase group established solid leads between miles 10 and 15. Although everyone in the main field contributed to catching the leaders, Magro’s group was never able to get closer than 3 minutes. Due to the strong winds on the back of the course and the high pace of the race, the average for 50 miles was almost 25 mph, the Peloton shrunk to only 8 riders by the finish. Magro was 4th out of this group as they crossed the line, good for 17th place out of 40 in his first A race. Sunday’s criterium course wound through the roads of Ohio State’s athletic complex as rider’s tackled a fast flat 6 corner track. Johnson, Lee and Ferguson began the day for Notre Dame in Men’s B. Marian launched an early attack and a 5 rider breakaway soon had an advantage of nearly 20 seconds over the main field. Organizing at the front of the field, Notre Dame was able to pull back the break, largely due to the long pulls of Lee. As soon as the first break was caught, two more Marian riders bolted off the front of the race and this proved to be the winning move. While the two leaders rode to nearly a minute’s advantage, Notre Dame rode conservatively in the pack and moved to set up a sprint for Lee. Lee notched an 11th on the day and both Johnson and Ferguson finished comfortably in 14th and 15th. As the Women’s A riders lined up for their 45 minute race, it was clear that, due to their large numbers, Marian would again be the favorite. The opening laps of the race saw one Marian woman after another take a turn attacking the field. As the only competitive non-Marian rider in the race, Perricone was taxed with responding to each acceleration. Finally, two Marian and a Lindsey Wilson racer established a breakaway and exhausted from her previous efforts Perricone was unable to respond. From this point on the field settled into a steady rhythm until the finish where Perricone’s dominant sprinting ability showed with her 4th place result. The final race of the weekend was the 60 minute Men’s A criterium. Magro started the race towards the rear of the main field as early fireworks erupted from both the Marian and Lindsey Wilson teams. Speeds in excess of 35 miles per hour kept any breakaways from getting away from the peloton and after 20 minutes of all out sprinting the pace began to settle. Around the 30 minute mark a rider from Indiana University drifted to close to the curb on the entrance to the chicane of the backstretch. When pedal struck concrete he was thrown over the front of his bike and into the grass. Luckily, he was the only rider to crash and was not seriously injured. With 10 minutes remaining, a group of 9 riders gained a small advantage over the pack and this 10 second gap help to the finish. Magro finished without difficulty in the main field and was content to have been competitive in his first A criterium. The average speed for the entire race approached 27 miles per hour. To spice up the newly christened blog, here is an article that appeared on VeloNews.com, one of the world’s premier cycling news sources, featuring results from the Lindenwood race. Included is the win in Men’s B from Joe Magro (complete with a glorious photo of his killer sprint finish) and a podium result in Men’s C from Nate Lee. Because of the Easter holiday, the Midwest Collegiate Cycling Conference only had one event this past weekend, a criterium next to the campus of Marian University in Indianapolis, Indiana. The one mile course featured a hill climb to the start/finish area every lap, as well as a tight S-bend down the hill and strong crosswinds on the backstretch. As has been the case for nearly all of2010, riders were greeted with wind and a steady rain throughout the day. Notre Dame’s first competitors were Josh Johnson and Nate Lee in Men’s C. Likely because of the miserable conditions, the field stayed largely together throughout the competition. Both Lee and Johnson rode comfortably in the relative shelter of the pack. With 10 minutes remaining in the 30 minute race Lee punctured his rear tire and was forced to abandon. In the final sprint to the line, Johnson finished in the middle of the pack around 17th position. Ethan Ferguson, Douglas Ansel, Brian Boyle, and Joe Magro all represented ND in the 45 minutes of Men’s B action. This highly competitive race took off from the gun as a larger than normal field shot down the hill and into the crosswinds. Speeds of over 35 mph were hit at times during the early moments of the race and a field of nearly 40 riders was quickly split in half. Boyle and Magro made the first selection of riders while Ferguson and Ansel settled into the second group. Ferguson was clearly the strongest rider in the latter group, but without help from his competitors he was never able to bridge to the leaders. With 20 minutes remaining in the race, a breakaway composed of two Marian riders and one from Lindsey Wilson formed. Magro sprinted out of the peloton entering the crosswind section and was able to bridge the gap to the leaders. The break’s advantage grew to more than 20 seconds until a Marian rider flatted and the Lindsey Wilson rider began to lose strength. With 10 minutes remaining, the field came back together again, but more attacks began the instant Magro’s group was caught. With 3 laps to go, another group of 3 shot off the front of the main field and this proved to be the winning move. Boyle tried to pull the leaders back on the final lap, but Notre Dame had waited too long as the field crossed the line mere seconds after the leaders. Magro placed 3rd in the field sprint for 6th overall while Boyle crossed the line shortly afterwards. Ferguson was the first to finish from his chase group while Ansel, feeling pain from his crash the previous weekend, pulled out of the race with around 15 minutes remaining. Following this weekend’s action, the stage has been set for the final act of the season. Both Ansel and Magro have now moved to the Men’s A category in the hopes of qualifying for the National Championships (May 8th in Madison, Wisconsin) with Jenn Perricone. Nate Lee also received an upgrade to Men’s B where he’ll join Ferguson and Boyle. Next week the cycling team will be at Ohio State University for the second to last regular season race of the year. Riders were greeted with sunny weather for the first time in 2 race weekends this past Saturday as sunny skies and warm temperatures found the University of Illinois at Carbondale. Saturday’s road race course featured a seven mile “stem” leading from the start/ finish onto a 9 mile loop. The entire course would through a state park filled with lakes, forest, and rolling hills. The first Notre Dame rider to compete was Jenn Perricone in the 42 mile Women’s A race. A third of the way through the competition, Jenn maneuvered herself into a breakaway of 4 riders who were clearly the class of the field. Being one of the strongest sprinters in the group, Perricone looked to be in excellent position for a win until, with less than 15 miles remaining; her chain was jarred loose at the base of a climb. Forced to dismount and fix the problem, Perricone lost a great deal of time to the leaders. This gap proved too large to close; however, the 4th place result was an excellent showing and bodes well for future races. Josh Johnson followed Perricone in the 33 mile Men’s C category. Johnson rode in the center of the pack for most of the race to avoid the powerful crosswinds. In the final kilometers he moved towards the front of the pack and sprinted to a 12th place result. Douglas Ansel and Joe Magro represented Notre Dame in the 42 mile Men’s B road race. The first 7 miles of the race were run at a pedestrian tempo but attacks began the instant the field began the first of three laps around the loop. A breakaway of 3 formed on the first major climb and quickly established a 25 second gap on the main field. Ansel hit the front of the peloton and began working to reel the break in, but a lack of cooperation from other schools paralyzed his efforts. The pace soon slowed again until, seeing an opportunity to attack coming around a turn into a headwind, Magro accelerated off the front and took off in pursuit of the breakaway. A rider from Marian University came along in Magro’s slipstream, but refused to help bridge the gap as Marian was already represented by two riders in the existing break. In an impressive display of strength, Magro caught up to the break and the group, now 5 riders, quickly established an insurmountable advantage over the rest of the race. By the end of the third and final loop, Magro’s break had put over 3 minutes on the main field and it was clear the winner would come out of this selection. The final miles of the competition were ridden at a lethargic pace, with no member of the breakaway wanting to expend unnecessary energy. When the finish came into view, the three Marian riders launched a final lunge to the line, but Magro was positioned perfectly to counter their effort. Coming out of the Marian slipstream with 100 meters to go, Magro powered past to take his second win in as many weeks. Back in the main field, Ansel was able to escape the group with 5 kilometers remaining but was swallowed by the peloton with barely a kilometer left to ride. Exhausted from the effort, he still sprinted to 4th place in the field, good for 9th overall. The clear skies of Saturday were replaced with a cold rain Sunday morning as riders raced through the campus of Southern Illinois in the criterium event. Two short climbs and descents on the .6 mile course made speeds of over 35 miles-per-hour commonplace throughout the day. These speeds, coupled with rain, poor pavement, and sharp turns proved to be a recipe for crashes. Clearly not paying much attention to the conditions, the Men’s B race containing Magro and Ansel got off to a blistering start with Ansel setting the tempo for many of the early laps. The group was quickly weeded out to the 15 strongest with both Ansel and Magro present. 25 minutes into the 45 minute event, Magro ran over a piece of glass and shredded his rear tire. Feeling the loss in pressure, he was forced to pull off and eventually abandon the race. Ansel’s luck was not much better as, less than a mile after Magro’s abandonment, he took a hairpin turn at speeds over 26mph, crashed violently, and tore a huge gash in his left thigh. Jenn Perricone closed the weekend’s action for Notre Dame in the Women’s A race. Early in the event, two Marian riders escaped off the front of the field with Perricone, a rider from Lindsey Wilson, and a rider from DePauw giving chase. These five riders eventually came together and left the weaker main field far behind. Perricone placed 5th in the final sprint, giving her two top fives for the weekend and her best showing yet of 2010. Riders of all categories competed in the road race on Saturday morning. The course was mostly rolling with one large climb and steep descent per 19 mile lap through the wilderness of Defiance Missouri. Nate Lee and Josh Johnson got the action started for Notre Dame in the 38 mile Men’s C Road Race. Both rode strongly throughout the event and could be spotted towards the front of the field for much of the morning. On the final lap, with a leading group whittled down to only 10, both Nate and Josh put in strong sprints and finished in 3rd and 5th places respectively. Next up for Notre Dame were Ethan Ferguson, Douglas Ansel, and Joe Magro, all racing in the 57 mile Men’s B category. As the riders rolled off the start line a cold rain began to fall and the wind picked up setting the stage for an epic race. The first lap was highlighted by the attacks of Ansel as time and time again he tried to break away from the main field. When the pace finally settled, Ansel’s accelerations had dropped all but 12 riders with both himself and Magro still in the mix for the win. By the top of the final climb at mile 45, only Magro remained in the shrinking front group of 8. Over the next 12 miles Marian University, who was still represented by three riders, launched attack after attack but Magro was able to match their accelerations. With 250 meters to go, Magro attacked himself and quickly distanced the other riders notching Notre Dame’s first win of the season by a comfortable 7 bike lengths. Jenn Perricone represented Notre Dame in the Women’s A race. While originally scheduled for 57 miles, this race was cut to 38 because of the worsening weather conditions. Marian University dominated much of the race with their large team dominating the other riders. Four Marian riders broke away from the field, but Perricone was able to ride strongly on her own in pursuit and came in solo for the sixth place finish. Sunday morning saw riders flying through downtown St. Charles, Missouri in the criterium event. The course was kilometer long with sections of cobblestones and one 150 degree turn. Josh Johnson was awake bright and early to compete in the Men’s C race. Things started well but quickly turned sour for Johnson as he found himself trapped behind a quickly weakening rider. As a result Johnson lost contact with the main field and although sprinting for two laps in an attempt to catch up he was forced to abandon. Hoping to avoid the misfortune of Johnson, Ansel and Magro both made a point to ride towards the front of the Men’s B race. As was the case most of the weekend, Marian’s higher numbers allowed them to attack time and time again until a breakaway of 3 was formed with one of their riders. Both Magro and Ansel attempted to bridge the gap to the break but the winds were too strong to ride quickly alone. Realizing chase was futile, both Notre Dame riders stayed sheltered in the field until the final laps. Ansel finally reappeared with 400 meters to go as he railed the final turn and separated himself from the pack. The field wouldn’t see Ansel again and he finished first in the field sprint or 4th overall. Magro wasn’t far behind and capped off an excellent weekend for ND riders in Men’s B with a 7th place finish. The Women’s A criterium was much the same as the road race the day before. Marian University attacked time and time again until their riders had all escaped together off the front of the main field. As more rain began to fall Perricone took it easy to avoid crashing on the slippery cobblestones but still finished highly in 12th overall. In a nice break from the perma-cloud and frigid temperatures of South Bend, the men’s cycling team traveled to Murray, Kentucky this past weekend for the first races of the collegiate season. Saturday’s completion kicked off with the 36 mile Men’s C road race featuring two ND riders, sophomore Ethan Ferguson and law student Josh Johnson. No attacks were launched during the first 18 miles of the race but the pace rocketed up at the beginning of the second lap as a multitude of accelerations rocked the front of the field. In the final 500 meters of the race, a sudden swerve by a rider in the center of the peloton caused a chain reaction crash which took out Johnson. Ferguson managed to avoid the accident and notched a 13th place finish. The last race of the afternoon, Men’s B, also contained two ND riders, PhD student Douglas Ansel and freshman Joe Magro. This 48 mile event over the rolling Kentucky hills started in much the same fashion of the Men’s C race with few serious attacks. Around mile 20 a breakaway formed with 4 riders and quickly gained over a minute’s advantage over the main field. Attempting to bridge to the break, Ansel attacked the peloton on the largest hill of the course but the 12mph cross winds on the plateau above proved impossible to ride alone and he was soon reeled back to the pack. At this point, Lindsey Wilson College began to block for the breakaway, which contained one of their riders. When the advantage reached over 1:30, Magro moved to the front of the field and set a 27mph tempo for the next 20 minutes drastically cutting into the deficit and reducing the main field to 15 riders. Unfortunately, at mile 30, a rider swerved into Ansel and jammed his quick release into Ansel’s rear wheel. After stopping to assess the damage, Ansel was unable to continue. After the break was swallowed by the 15 man chase group, the pace drastically slowed until the final mile when Indiana and Lindsey Wilson College began to set up their sprinters for the finish. Magro was boxed into the center of the field during the final dash to the line but was still able to salvage a 9th position. Sunday’s racing was held on a fast sweeping 1 mile course in suburban Murray. Ferguson and Johnson again competed in the Men’s C race and were. The field largely stayed together throughout the race and Ethan spent time pulling at the front keeping the tempo high. Johnson largely stayed protected in the field as the winds were in excess of 10mph on the largely exposed course. Johnson put in a strong sprint and finished 10th while Ferguson also was towards the front and came home 15th. Attacking began from the gun in Sunday’s Men’s B race as the field averaged around 30mph for the first 3 laps. Magro and Ansel both rode at the front of the field and largely controlled the speed to discourage any early breakaways from forming. Knowing if a Lindsey Wilson rider managed to escape the field their team would begin to block, Magro covered all Lindsey Wilson riders who attacked off the front of the pack. Unfortunately, the one rider that wasn’t covered established the break of 3 which lasted until the end of the race. The main field was largely uncooperative in working to pull the break back so Ansel and Magro both cruised in the top 15 and prepared for the sprint at the end of the race. A decision was made to set the sprint up for Magro, so Ansel hit the front of the main field with about 800 meters to the finish and threw down a massive attack to string the group out into a line. His acceleration was so great Ansel actually established a 50 meter gap on the field. Seeing this, Magro got off the front and Ansel time trialed alone to the finish. While he was overtaken by the winner of the field sprint, Ansel still came home in 6th position. Magro finished a few riders back from Ansel in 11th.